The new 8-inch Plastic COM-PAX-IAL Blower model with canister features 50 feet of ducting. The unit is made of durable, lightweight corrosion, UV, and chemical-resistant polyethylene, with sturdy, easy-grip handles molded directly into the blower and canister housing. This unique design with a tools-free canister locking system allows the user to remove the canister and ducting from the outlet side and attach it to the inlet side in a matter of seconds. 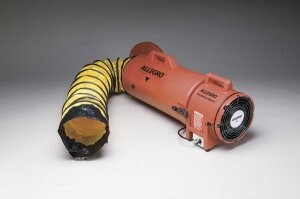 The weather-resistant canister unit now houses the option of 50, 25 or 15 feet of ducting. The blower will deliver up to 831 CFM. The AC and explosion-proof models feature a 1/3-hp motor. The explosion-proof blower includes a NEMA rated 115V plug for use with an explosion-proof socket. The DC model offers a 1/3-hp motor and can run off a truck battery.